"So easy a caveman can do it! My father-in-law created this quick and easy meal. 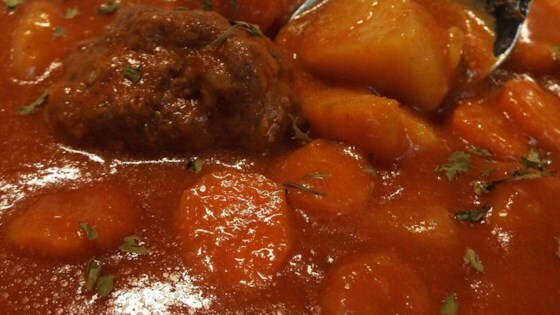 Basic ingredients of ground hamburger, potatoes, carrots, one onion, and a can of tomato soup. Cook in pressure cooker for 15 minutes, and it's a yummy, easy dinner. Kids love it! Serve with butter and a biscuit for a great meal." Shape ground beef into 6 meatballs. Mix carrots, potatoes, and onion in the bottom of a pressure cooker. Arrange meatballs atop the vegetables. Pour tomato soup and water over the vegetables and meatballs. Seal the pressure cooker and heat over high heat until the pressure is raised. Reduce heat to medium and cook for 15 minutes. Release the pressure from the pot according to the manufacturer's instructions. We all really liked this. The only things I did different were to season the beef with some salt, pepper and garlic powder and to make 12 meatballs instead of six since 4 people were eating it. I don't have a pressure cooker so a big pot worked just as well. And instead of waterni used beef broth. It was so yummy quick and simple. Perfect for the cold night..
amazing recipe my family loved it! I added a little salt and pepper plus yellow zucchini to the mix and it was amazing. Easy healthy dinner night. This was delicious. Easy and quick. Based on the other reviews, I did add a few seasonings to the meat. Would definitely make it again. Hubby loved it.